Some people might think all rice and noodle dishes are the same, but there are rich and distinct differences between these dishes; understanding these differences can enhance your entire dining experience. The Thai House Group wants to expand your knowledge regarding Thai rice dishes and noodle dishes. You are probably going to come across Thai rice dishes while looking for Thai food Vancouver, but you may be wondering about the distinctions. There are three types of rice that are normally used in Thai cuisine and they are: jasmine, coconut, and sticky rice. Each of these could have a major impact on the flavour of your dish. The most distinctive aspect of Jasmine rice is its subtle floral aroma, giving food an interesting characteristic. When cooked right, the rice is also silky soft though still slightly sticky. This type of rice pairs perfectly with coconut milk, which is why steamed Thai rice with coconut milk is such a beloved dish. Coconut rice has a soft texture with a touch of sweetness, which is still relatively easy to season. This kind of rice would work in a Khao Pad Sapparod dish. Sticky rice is shorter and fatter than other rice. This type of rice tastes better the longer it soaks in water, which is typically a day. This rice usually pairs well with Neua Pad Katiem. While looking for the best Thai food Vancouver, one will likely discover how important noodles can be for a dish. There are three main noodles to get acquainted with- vermicelli, flat noodles, and bami. Vermicelli is normally made out of rice, which gives it a very distinct flavor and a white color when cooked. This type of noodle taste great in sauces and pairs well with seafood like the Bamei Rommitr dish. Flat noodles are commonly used in stir fry dishes like traditional Pad Thai noodles. Their firm texture makes them great to fry, and the taste is definitely worth it. Bami noodles are made out of wheat flour and eggs, which gives it a rich taste that should pair well with the Goong Noon Hae dish. This dish is made of deep-fried prawns wrapped in noodles. 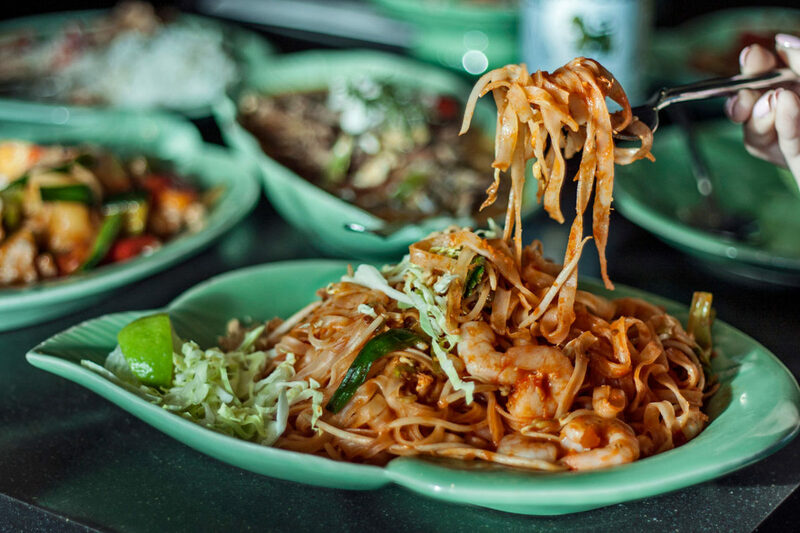 Now that you know a little more about Thai rice and noodle dishes you can get the most out of some of the specials offered by the Thai House Group. Visit our Thai House Restaurant, Urban Thai Bistro or Pink Elephant to try out some of the dishes mentioned in this blog. Happy Hour at Urban Thai is 3PM to 6PM and 9PM to 10PM daily.